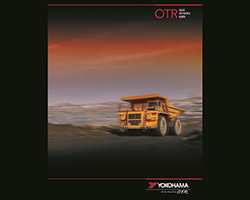 Yokohama Tire Corporation’s latest Off-the-Road (OTR) Sales and Reference Guide is now available in print and online. The 82-page guide is armed with key Off-The-Road industry tire and maintenance guidelines, as well as information on Yokohama’s complete line of OTR tires. To get the print edition, Besancon said to contact your local Yokohama sales representative. The online version is available at https://www.yokohamaotr.com/otr/resources.